As many of you know, the Inn on Mill Creek is a site in the Mountains Region of the North Carolina Birding Trail, a state-wide driving trail of sites where people who love birds can do some quality bird watching. Thanks to our guest, Richard, we are also birding Hotspot on www.ebird.org (a joint project of Audubon and the Cornell Lab of Ornithology). We see our fair share of birds here at the Inn; there are over 120 species of birds who make their home here at different times of the year. This time of year in particular, we see lots of birds heading to their vacation homes in the south. 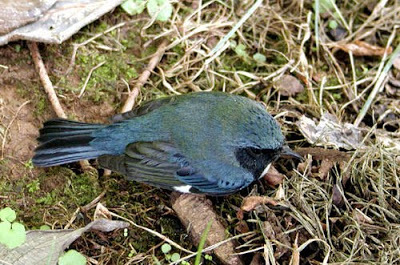 One such bird is the Black-throated Blue Warbler. 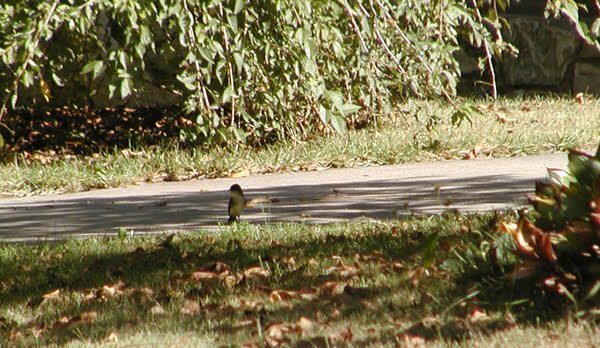 These little guys can be found hanging around our neck of the woods from Spring until Fall, before migrating south to the Caribbean for the winter (lucky birds!). 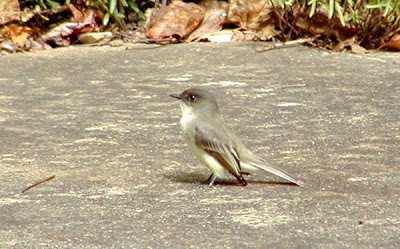 To be honest, we hear them a lot, but they aren’t the easiest to spot because they are small and like to stay in the woods. 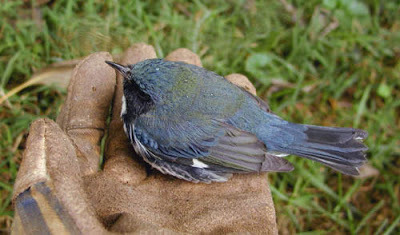 So imagine our surprise when one flew into a window at the Inn. At first, we thought the worst, but it turned out he was just stunned. Brigette helped him gently back over toward the woods and waited while he regained his little legs under him, chirped a few times and headed back into the trees. 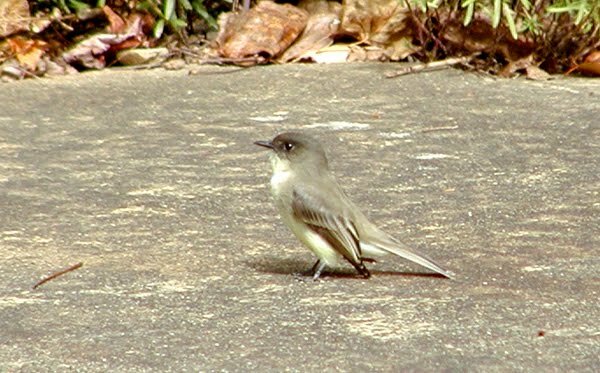 Not more than an hour later, Brigette was outside again and spotted our resident Eastern Phoebe, or rather, the Phoebe spotted Brigette. [That’s our Phoebe at the beginning of this blog post…it’s very photogenic.] This little bird has lived above the Front Porch door at the Inn for more than three years now, and it has become pretty social. You may remember the baby Phoebe incident of 2009. Well, ever since then, our Phoebe likes to follow us around sometimes. This day, the Phoebe was puttering around the driveway (there it is, pictured above, keeping an eye on things) and then it decided to check out the swing that Dave recently installed. It’s good to know the Phoebe approves of our newest project at the Inn! 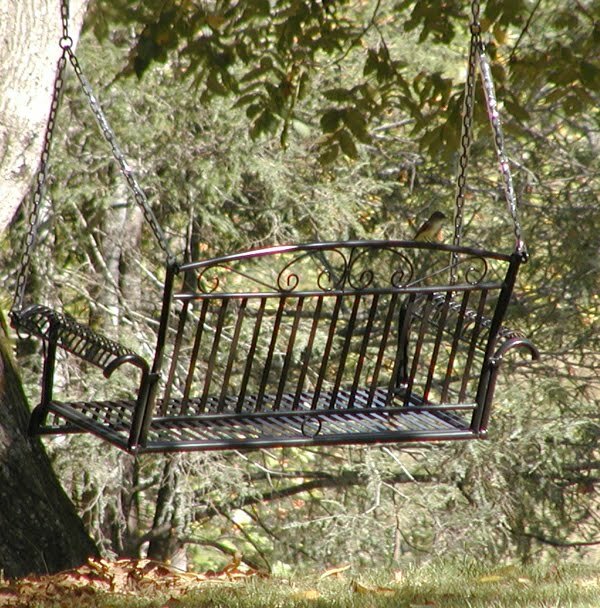 Can you spot the Phoebe, perched on the back of the swing in the photo below? It hung out there for quite some time, wagging its tail like it always does. If you enjoy birding, let us know when you visit the Inn and we’ll give you a list of birds that you might see and hear while you’re on the property. And be sure to check out www.ncbirdingtrail.org for more birding sites near the Inn on the North Carolina Birding Trail. Most are public sites, while others, like ours, is private and available to the public by appointment. This entry was posted in Uncategorized and tagged birding by Inn on Mill Creek. Bookmark the permalink.